Over the past year, after analyzing the images and other data that New Horizons has sent back from its historic July 2015 flight through the Pluto system, the scientists think they've solved the mystery. 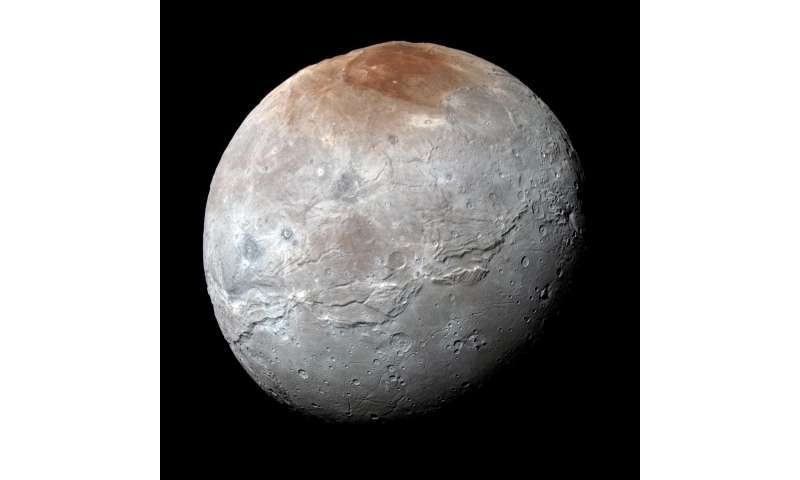 As they detail this week in the international scientific journal Nature, Charon's polar coloring comes from Pluto itself – as methane gas that escapes from Pluto's atmosphere and becomes "trapped" by the moon's gravity and freezes to the cold, icy surface at Charon's pole. This is followed by chemical processing by ultraviolet light from the sun that transforms the methane into heavier hydrocarbons and eventually into reddish organic materials called tholins. Sunlight further irradiates those leftovers into reddish material – called tholins – that has slowly accumulated on Charon's poles over millions of years. New Horizons' observations of Charon's other pole, currently in winter darkness – and seen by New Horizons only by light reflecting from Pluto, or "Pluto-shine" – confirmed that the same activity was occurring at both poles. Image: The youngest crater on Charon? "Every time we explore, we find surprises." This is arguably the most important lesson of all. It tells us that exploration is essential because science will stall without access to these surprises. It tells us there are no predefined limits and we will learn by exploring the moon, Mars, Proxima b and so on. It also tells us there are no substitutes for exploration. We can model and simulate, but the vast number of chaotically interacting physical variables that work to create planets and moons ensure we will never be certain about conditions on any one of them until we explore them, preferably in person. "reddish organic materials called tholins"
Reading (very briefly) on tholins it's interesting they call them "organic"... or they call Methane an "organic compound"... I see organic can be define as either "related to" or "derived from" living matter... It seems they call methane organic because it's usually derived from living matter... but in the case of Pluto or Charon I would think there would be nothing organic about it? (or at least, that would be a huge jump to make to assume there's life on either!). I guess it could be considered organic from being "related to" something that is normally derived from living matter... but seems a bit missleading? "Charon's polar coloring comes from Pluto itself - as methane gas that escapes from Pluto's atmosphere and becomes" trapped "by the moon's gravity and freezes to the cold, icy surface at Charon's pole." Completely wrong thinking and totally outside the laws of physics. Larger body dictates rules of the game. Charon behaves similarly to other bodies (Titan, Enceladus ...). Due to the tidal forces and movements of the body structure in the polar areas of the body come up ejection of matter. The temperatures on Pluto max. -210 ° C does not allow the existence of gas CH4 because it immediately freezes and falls to the planet. If the cap on Charon of CH4, he was created on Charon. Try wikipedia: "An organic compound is any member of a large class of gaseous, liquid, or solid chemical compounds whose molecules contain carbon". That is the general rule. "Organic" compounds are just compounds that contain carbon atoms, as simple as that.